What will be trending in Beacon Technology in 2018? It’s hard to find a beacon solution provider who isn’t either pivoting to the enterprise or increasing their focus on the space. The reasons are clear, success of Enterprise projects is easier to control. Employees generally have to do what they are told to do, customers not so much. Applications like asset tracking are saving capital spend in hospitals, with more efficient usage of scarce equipment. If they can track pallets, tools and staff, factories can increase yield, reduce write offs, and better support leaner just-in-time production. Office space and meeting rooms can be managed better now that the RFID cards employees are issued can include a Bluetooth chip. Unbeknown to most people, the National Emergency Address Database LLC, jointly owned by AT&T, Sprint, T-Mobile and Verizon, has just finished developing a database to track all the Wi-Fi access points and Bluetooth beacons in the United States. The driver was to meet those carriers’ commitment to the FCC to deliver floor level and maybe even room level dispatchable address information to 911 first responders. This could save lives and reduce the disabilities that result when ambulance crews can’t find a stroke victim in a timely manner. As a result, not only will building owners have a philanthropic incentive to deploy Bluetooth beacons in every room to save lives, it will also reduce their liability and insurance costs. If first responders can’t find someone in distress because building owners failed to invest in beacon infrastructure, that building owner may be liable to litigation from friends and family of the victim. The NEAD database won’t be available for commercial use, but this public safety initiative could do for indoor location what military applications did for outdoor location / GPS. In 2018 there will be a growing number of pilot projects to embed Bluetooth beacons into packaging for high value consumer goods such as pharmaceuticals, cosmetics, and sports apparel. By 2019 the cost of a “passive” (battery free) Bluetooth beacon will be less than a dollar, and the Total Cost of Ownership will be reduced by an order of magnitude. Semiconductor companies like Wiliot (full disclaimer: I work for Wiliot, who also underwrite the Mr. Beacon Podcast) are working on Bluetooth radios that will harvest their energy from radio waves, reducing the size of a fully functioning system with an ARM processor, sensors and an antenna to that of a finger nail. This will be great news for the entire Bluetooth ecosystem. Hub vendors, gateway vendors and beacon vendors will sell more products as these tiny leaves (passive beacons) augment their powered branches of the IoT tree. With the addition of these extensions to beacon infrastructure, the Internet of Things will scale at an accelerated rate. Products and packaging will become a lot smarter. Don’t expect Apple or Google to do much more with their beacon standards. iBeacon and Eddystone are to all intents and purposes done. Apple’s business drivers are around experiences that drive the use of the phone. Google now has what it needs to build the links between AdWords and the Bluetooth beacon ecosystem. Some of the most successful beacon solutions have been in the world of advertising and promotions, e.g. ShopKick, inMarket and Verve. These have been successful because they have been focused on specific market segments and have provided a complete solution to brands. The companies that can really monetize this technology are only just getting started. Keep a watch on Facebook and Google for that. 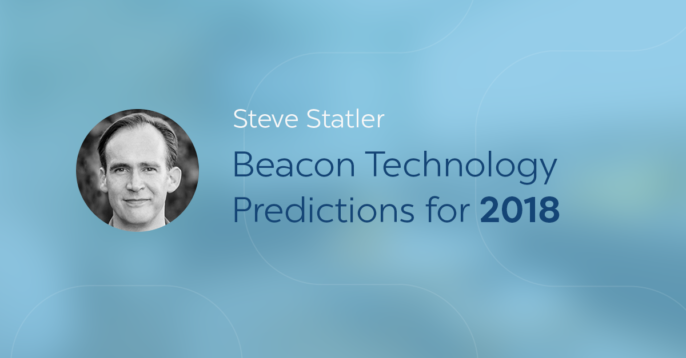 What’s holding beacon technology back/what hurdles must they overcome in 2018? There are different factors for different use cases. It’s still about achieving scale. No brand is going to fully commit to beacon triggered location advertising until it can do so across all markets. The players who have achieved success so far have done so by sharing revenues, or at least value between all the stakeholders, in particular venues and app publishers. This has driven the deployment of beacons in niches. Facebook and Google probably won’t be so generous to venue owners and so that means the infrastructure will need to grow another way. For enterprises to invest in beacon enabled solutions in large numbers, they need to see the fruits of the early adopters’ investments publicized at conferences and in the industry specific publications that they trust. That’s still a work in process. The solutions need to be more complete and the performance of the systems needs to continue to improve further. Within a few months the Bluetooth standard will evolve to support profiles that will raise the accuracy of an RTLS significantly, so that performance increase will happen and we can expect a spike in adoption as a result. Now that NFC is supported by iOS 11, confusion as to when to use NFC and when to use beacons will increase. This will be resolved as solution designers realize the limitations of NFC on iPhones (you need an app to be running – unlike on Android) and beacon vendors continue to embrace both NFC and BLE radio technologies in their products. What would you consider the biggest story, innovation, or upset in 2017? iBeacon 2.0 never appeared and Google Eddystone appears to be done. It’s unlikely that either standard will evolve much, so we need to get over that and fill in the remaining few gaps ourselves. Google did a good job of filling in most of the big gaps, but there still remain a few, like the limited payload on the TLM packet. We need a standard way of sharing sensor information beyond the battery life of a beacon. We also need to consider what to do for users that don’t trust Google. Better interoperability would help the ecosystem grow – after all who wants to commit to a single source for their beacons? AltBeacon anyone? Google’s Eddystone URL standard was a great idea and it still has a great future, but when the integration with Chrome never made it fully out of Beta and into production, we were left with a user experience that confined the messages to users to low priority alerts from the Android OS onto the lock screen and status bar. That said, when we deployed Physical Web beacons at San Diego airport, we saw a 100x more engagement than from the QR code and NFC smart posters that were offered at the same time. It’s going to take self-discipline from the ecosystem to avoid SPAMy campaigns that add real value to users if we are going to coax Google into finally pulling the trigger and adding Physical Web to its flagship browser. Crossing the digital to physical chasm is taking longer than we all hoped – some beacon companies have either disappeared or consolidated with others in order to combine their pieces of the puzzle and deliver more complete solutions. As stronger players with larger customer bases and better solutions continue to grow, expect to see more funding rounds as they replenish their coffers for the long journey “crossing the chasm”. Most of the major beacon players are offering richer solution layers that allow them to monetize their hardware. None of the challenges that face the “Beacosystem” should surprise us. I’m more optimistic this year than the last year when I made my contribution to this prognostication project. Need more insight on Bluetooth beacons and tags in 2018? Make sure to check out our complete industry report.